Aqua Park Bahrain has assigned Cloudme to design and develop their official website to offer online booking of swimming pools, indoor and outdoor soccer fields and fitness (GYM) services. Aqua Park website visitors can search for a swimming pool, football field and select the date and time needed for their event. Then they can book and pay online with a few simple clicks. Cloudme team designed a new logo with fresh colors and clear typeface to distinguish Aqua Park from other competitors in Bahrain. 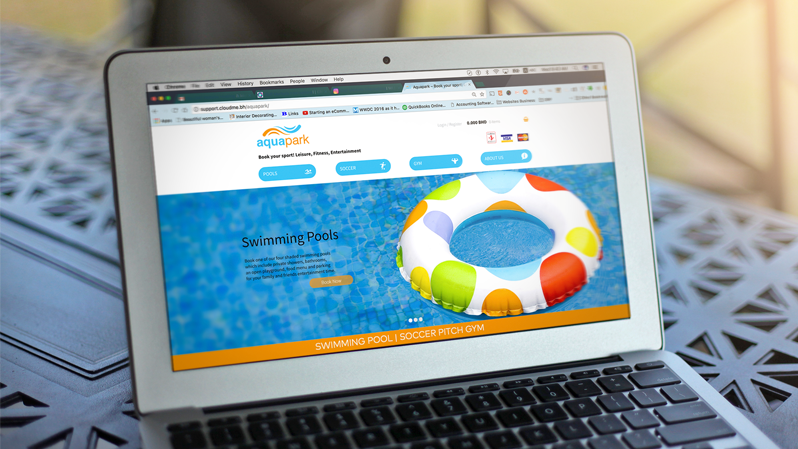 Working closely with the design team, Cloudme technical team, developed Aqua Park e-commerce user-friendly website, which enables to book leisure & sports services online in around the clock and pay for the services using Visa, MasterCard, and ATM cards. Aqua Park Having been involved in offering sports, leisure activity booking and gym membership in Bahrain for more 12 years, Aqua Park has transformed. Moving to create a long-term solution for easy and effective fitness, form, and fun time, Aqua Park has moved to create a convenient, easily booked and simple to find fitness and leisure centre. The Park currently covers an overall area of approximately 12,700 square meters. Whether it’s for the high-end swimming pool, soccer pitch or full-time gym membership in Bahrain, Aqua Park offers customers to find exactly what they are searching for at the best value! This entry was posted in Branding, Cloudme News, E-commerce, Logo Design, Online Payment and tagged branding, e-commerce, Logo Design, Website.